Variation of size of RBC is called anisocytosis. The normal size of RBC is 7.5+/-0.2 micrometer in diameter. Nucleus of small lymphocyte is useful guide to the size of RBC. Anisocytosis is divided into Macrocytosis and Microcytosis. Microcytosis: RBCs smaller than the normal size are considered as microcytes. Microcytosis is seen in : Iron deficiency anemia, thalassemia, lead poisoning, sideroblastic anemia and anemia of chronic disorders. Macrocytosis: RBCs larger than the normal size are considered as macrocytes. Macrocytosis is seen in : Liver diseases, hypothyroidism, megaloblastic anemia, chemotherapy, post splenectomy and some other causes of elevated erythropoiesis. RBCs that appear disc shaped and having an area of central pallor that occupies approximately one-third of the cell’s diameter (containing normal amount of hemoglobin) are considered as normochromic RBCs. Hypochromic : RBCs that have an area of pallor that is larger than the normal are called hypochromic. This variation is seen in : Iron deficiency anemia, anemia of chronic diseases, thalassemia, some hemoglobinopathies, sideroblastic anemia and any of the conditions leading to microcytosis. Spherocytes: RBCs lacks the biconcave shape and becomes more spherical, no central pallor is present with increased hemoglobin content. Spherocytes are found in : hereditary spherocytosis, hemolytic anemia and post transfusion reaction. Ovalocytes are found in : Thalassemia major, hereditary ovalocytosis, sickle cell anemia. Elliptocytes: The RBCs are ovaal or elliptical in shape, long axis is twice the short axis. Elliptocytes are found in : hereditary elliptocytosis, megaloblastic anemia, IDA, thalassemia, myelofibrosis. Target cells: Red cells have an area of increased staining which appears in the area of central pallor. Target cells are found in : obstructive liver disease, severe IDA, thalassemia, Hemoglobinopathies, post splenectomy. Teardrop cells: RBCs having the shape like teardrop or pear. These are usually microcytic and often hypochromic. Teardrop cells are found in : myelofibrosis, megaloblastic anemia, IDA, thalassemia. Schistocytes: These are helmet or triangular shaped, fragmented or greatly distorted RBCs smaller than normal size. Schistocytes are seen in : Thalassemia, microangiopathic hemolytic anemia, mechanical hemolytic anemia, uremia, artificial heart valves. Acanthocytes: RBCs with irregularly spaced projections. Projections vary in width but usually contain a rounded end. Acanthocytes are found in : liver diseses, post splenectomy, anorexia nervosa and starvation, alcoholism, vitamin C deficiency. Stomatocytes: Red cells with a central linear slit or stoma. Seen as mouth shaped form in peripheral smear. Stomatocytes are found in : excess alcoholism, alcoholic liver disease, heref=ditary stomatocytosis. Keratocytes: These are half-moon shaped cells with two or more spicules. Keratocytosis is seen in G6PD deficiency, pulmonary embolism, disseminated intravascular coagulation. Burr cells: Red cells with uniformly spaced pointed projections on their surface. Burr cells are found in hemolytic anemia, uremia, megaloblastic anemia. Sickle cells: These are sickle-shaped Red Blood Cells. 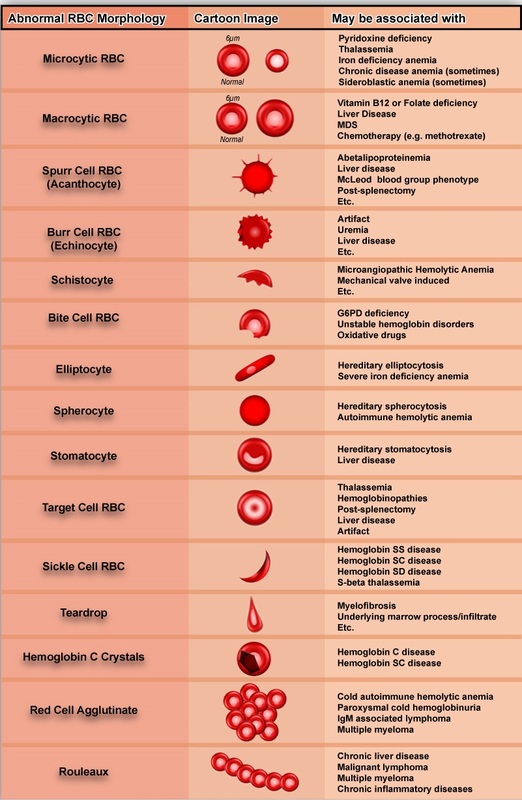 Sickle cells are seen in Hb-S disease/ sickle cell anemia. Red cell agglutinate: These are irregular clumps of RBCs. These are found in cold agglutinations, warm autoimmune hemolysis. Rouleaux Formation: Stacks of RBCs resembling a stack of coins. These are found in hyperglobulinemia, hyperfibrinogenaemia. Howell-Jolly bodies: Small round cytoplasmic red cell inclusion with same staining characteristics as nuclei. These are fragments of DNA. Usually seen in Post splenectomy, MBA, hemolytic anemia. Heinz bodies: These represent denatured hemoglobin (methemoglobin) within a cell. With a supravital stain like crystal violet, Heinz bodies appear as round blue precipitates. Seen in G6PD Deficiency, splenectomy. Pappenheimer bodies: These represent iron deposits which as dense blue, irregular granules in wright stain. 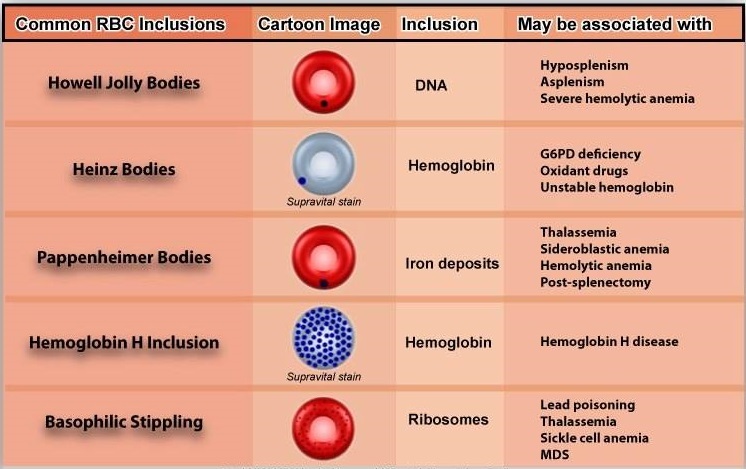 Pappenheimer bodies are found in RBCs with hemolytic anemia, splenectomy, sideroblastic anemia, thalassemia. Basophilic stippling: These are considerable amount of small basophilic inclusions in red cells which represent precipitated RNA. Seen in : thalassemia, MBA, hemolytic anemia, liver damage, heavy metal poisoning. Cabbot’s ring: Reddish, purple, thread-like rings in RBCs of severe anemias. These are the remnants of nuclear membrane. Parasites of red cells: Protozoan parasites like one of the four species of the malarial parasite may be seen in case of malarial infection. what if there is increase or decrease in number???? ?